The remedy in the court case, which is a long shot for many technical and legal reasons, would be to have single member districts for the election of the state supreme court and criminal court of appeals. The two El Paso and Rio Grande Valley districts might elect Democrats, but the other 7 would be even more firmly Republican. It would be a win for Republican lawyers/judges who live in medium sized cities in those areas of the state from which no judges currently come, and would probably mean that current Supreme Court judges who come from the same town would be paired against each other. 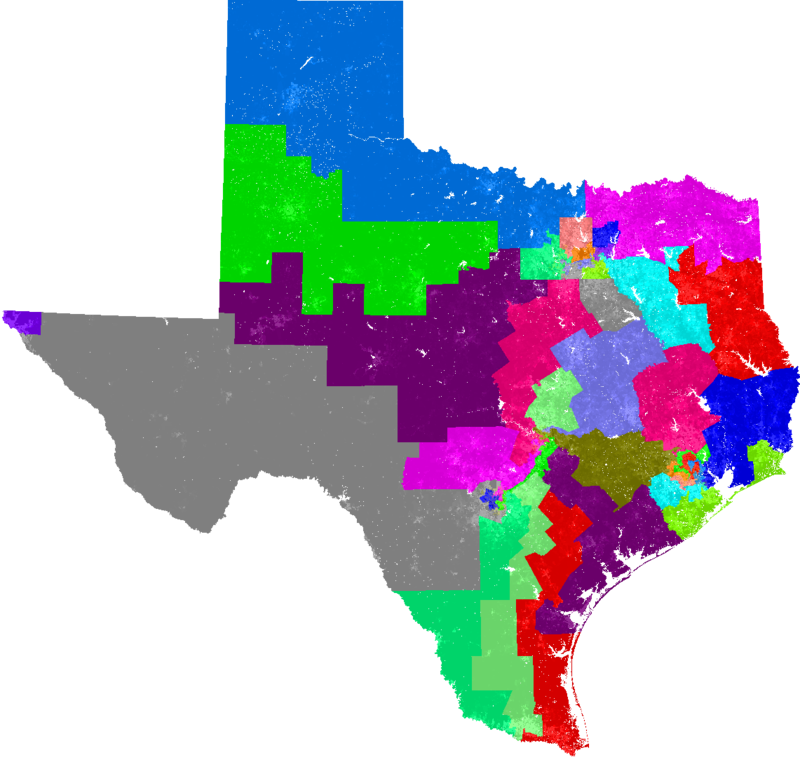 (Justices John Devine, Eva Guzman, Jeff Brown might all be in the same district). I don’t think we have any current Supreme Court justices form Tyler or Beaumont or Corpus Christi or Amarillo, and those districts might not have incumbents in a single member plan. (1) There are 13 distinct geographic districts for those courts. 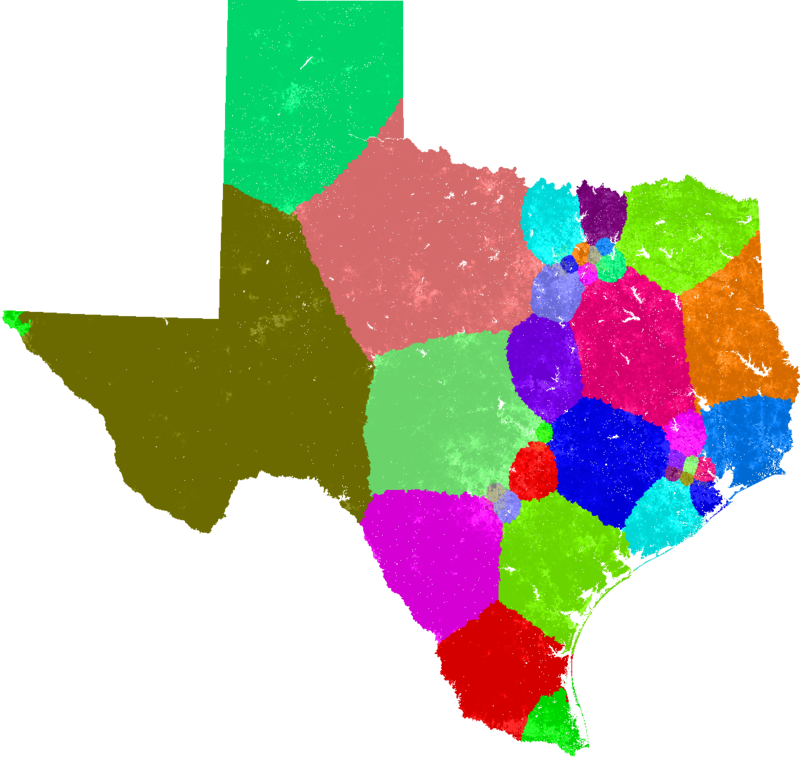 (There are 14 courts of appeals, but the 1st and 14th cover the exact same territory; I also think two of the districts in NE Texas have some overlap, but don’t perfectly coincide.) However, there are only 9 seats on the Texas Supreme Court and on the Court of Criminal Appeals. (2) The court of appeals district do not have equal populations. For example, 1.8 million people voted in the contested election for Chief Justice of the 1st Court of Appeals (which includes Harris County) in 2016, but only 880,000 voted in the contested election for a seat on the 4th court of appeals (which includes San Antonio). As a remedy in this case, the court or legislature would have to draw 9 equally populated geographic districts. Right now the TX Supreme Court is 9 Republicans. If this succeeds, it would be at least 7-2 (the Latino districts would almost certainly elect Democrats). 9 million people voted for President in 2016. So each of the 9 Supreme Court districts should have about 1 million voters (in presidential years). The results in the 1st Court of Appeals races in 2016 were: (1) for Chief Justice, 960,000 (Rep) to 886,000 (Dem); and (2) for Seat 4, 942,000 (Rep) to 903,000 (Dem). BUT in Harris County alone, the results were: (1) for Chief Justice, 620,000 (Rep) to 657,000 (Dem); and (2) for Seat 4, 602,000 to 672,000. Harris County might have to be split since it alone had over 1 million voters, but assuming it isn’t, and is created as its own TX Supreme Court district, it would easily be a Democratic district, making the Texas Supreme Court 6 Reps to 3 Dems. A district including Dallas might give Dems a 4th seat. I think this would be very good for the Texas high courts. Right now, you have several undistinguished, not-too-bright judges on both courts. And the quality of the opinions suffers from the fact that there are not dissenting views. No, I was not thinking of the appeals courts districts. Based on 2010 population data, each equipopulous Supreme Court district would be 2.8 million. Harris County has 4.1 million and so would be split. While it is possible to split Harris in a manner which results in one Democrat district, it is also possible to split it down I-10 and pair the top with Montgomery and the bottom with Brazoria and Ft Bend in a manner which creates two GOP districts. I would anticipate the GOP legislature would get a crack at doing the districting, and would protect Republican interests, and certainly would have first crack after the 2020 census data is available to redo any interim districts. Nonetheless, I do not anticipate this lawsuit to succeed. I expect both Courts to remain elected at large. (1) When you said “Tyler or Beaumont or Corpus Christi or Amarillo, and *those districts*…” it sounded like you were referring to the courts of appeals. The only districts in Texas that are identified by those city/town names are the courts of appeals districts. But no way Amarillo wouldn’t be in the “Lubbock” district if we had 9 equipopulous districts. And no way Eastland would be the center of any of them. (2) Very doubtful they could get away with splitting the heart of Harris County in half via I-10. Opens that plan up to challenges for diluting Hispanic and black voters in Harris County. Of course, the legislature is pretty stupid, so they might try that. But if they’re tired of getting slapped down by the courts, they would probably carve out some of the predominantly Anglo parts of northern and/or western Harris County–maybe put those areas in a “Waco” district. (3) We’ll see about the merits. But there’s very good evidence of racialized voting patterns in Texas Supreme Court elections and that those patterns disenfranchise Hispanics. Just ask former (Republican) Justices Xavier Rodriguez and David Medina. We don’t thank Charles often enough for all that he does. This was an important update on important issues nicely summarized. Onew way to look at single member Supreme Court districts is to take the congressional districts and each judge will have four adjoining. Here are the 36 districts drawn automatically with no partisanship.